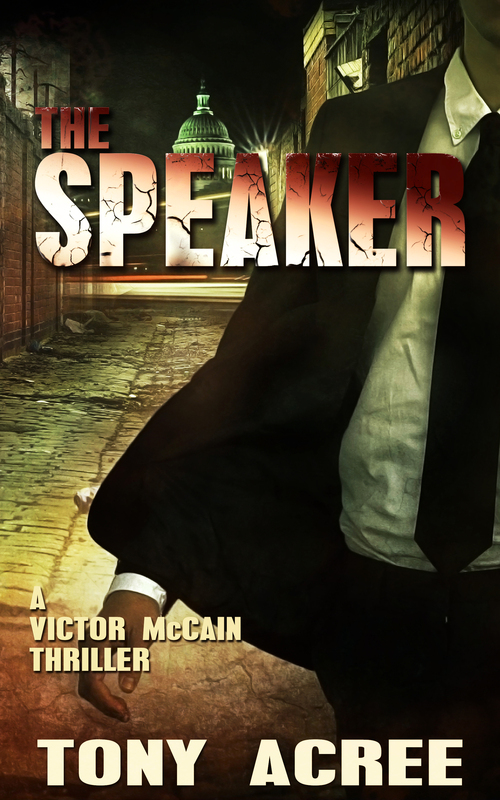 I am close to finishing The Speaker, the third book in the Victor McCain series, and I wanted to share Chapter 1 for your reading pleasure. Let me know what you think in the comments section. Eduardo kept watch out the front window while Congressman Owen Grenville committed suicide. True, the congressman was not doing so willingly, but in the end it would be suicide, nonetheless. Outside all was quiet in this upscale section of Georgetown, not far from the university. A row of town homes crouched on each side of the street, occasionally illuminated by the light from a street lamp. It was a bit before ten p.m. at the end of July, the night warm and pleasant. Activity was starting to wind down, the sidewalks now mostly empty as residents settled in for the night. Eduardo turned from the Norman Rockwell view out the window to take in the macabre scene inside this particular town house: Congressman Grenville stood on a dining room chair, a hangman’s noose fit snuggly around his neck with the other end tied to the wooden balcony railing above his head, while tears cut a path down the wrinkled folds of his aging cheeks. Standing in front of him was a woman holding in one hand an iPad, turned in such a way that the congressman could watch what was on the screen, and in the other hand she held a gun down at her side. About five and a half feet tall, with a ballerina’s build and long black hair cascading down the small of her back, the woman was the picture of beauty. Deadly beauty, Eduardo thought. For six years they were partners in death, hired assassins known for pulling off the perfect murders, the ones people never suspected were murderers at all. They charged exorbitant amounts of money for their services, but those in need paid. There was no one better than them. He called her Donut because they could not pass a Krispy Kreme donut shop without stopping to buy a dozen for her to eat. It was her one and only vice, as far he knew. How she kept her figure, Eduardo had no clue, but keep it she did. From time to time they spent evenings in bed together and he knew her body was flawless. She was the one who gave him the name Eduardo, saying his olive complexion reminded her of a Latin lover from her past she was forced to kill after he became too clingy. Neither knew the other’s real name, nor likely ever would. A pudgy man with only a hint of hair circling a bald head covered in sweat, the congressman cut a pitiful figure as he begged for his life. Known as a party firebrand, he would stand for hours in the well of the House of Representatives, taking on any and all who stood in his way as he climbed the ladder of the party hierarchy. Eduardo was sure, never in his wildest dreams, did he ever picture his life ending in anything but personal glory and power. Life could sure be a kick in the teeth. The congressman’s eyes darted back to the iPad where a video feed showed a view of his wife and teenaged daughter sitting on a couch watching television. The camera doing the filming had a clear shot through a patio door in their suburban South Carolina home. Donut turned the iPad off and tossed it on a nearby couch, waiting. Eduardo knew from experience she hoped the congressman missed the ten p.m. deadline. Donut loved killing people. She got off on the mayhem and destruction it caused in the lives of the victim’s families. As for himself, he was in it for the money. And the challenge. Killing people in ways which went undetected was the highest form of high for Eduardo. He considered the two of them artists. They didn’t paint on a canvass or work with clay to make beautiful statues. Their art came in the form of murders which required great creativity. Tonight, a suicide was preferable, but the client wanted him dead, in whatever way accomplished. “And you have very powerful enemies, it seems, hence why we are here. Tick-tock, tick-tock.” She pulled a phone from her pocket and waved it at the congressman. And with a kick of his foot, he knocked the chair backwards to the ground. The fall was only a few feet, but gravity did the rest, with the congressman’s feet kicking back and forth mere inches from the ground as the noose strangled him to death. Fingers scrabbled for purchase, as he tried to loosen the rope, but without success. Donut smiled, waved the phone at Grenville, then slipped it back into her pocket. Grenville reached out towards her in what might have been a pleading gesture, but Eduardo couldn’t be sure. Soon his efforts grew feeble, then stopped all together as the noose cut off the blood flow to his carotid artery. Eduardo knew it would take another ten to twenty minutes for the congressman to die and they would wait until they knew for sure the job was completed. When they were sure Grenville was dead, Eduardo pulled out a phone, took a picture of the congressman to send to their client later that night, assuring the rest of their fee would be placed into an offshore account for them the next morning. He picked up the bag and they left the congressman’s town home, leaving no trace of their visit behind. They quickly walked the three blocks to their car, with Donut sliding in behind the wheel, while he tossed the bag in the back, hopped in the passenger seat and hit the recline button. She pulled slowly down the darkened street, while he closed his eyes and tried get some sleep. They would be on the road for many hours as they drove to their next job and he wanted to be well-rested so he could watch the news coverage the next day. The suicide of Congressman Grenville would be national news. And while the next murder wouldn’t be as newsworthy, in the end, it would be the one to bring a nation to its knees. I didn’t want it to stop!